Swami Amar Jyoti was born on May 6, 1928 in a small town in northwestern India, not far from the banks of the Indus River. His childhood interests were science, math, music, writing, cycling, drama and sports, and He brilliantly excelled in all of these. His college education was temporarily interrupted by the crisis of the partition of India. In 1948 He left college and traveled to the border of Bangladesh, and soon headed the entire volunteer corps there, working tirelessly 20 hours or more each day. After about ten months, the flood of refugees subsided and He returned to Calcutta. On the outskirts of the city in a quiet ashram He pursued classical music, sitar, religious studies and prayer. It was during this time that visions began awakening in Him. He began to meditate and do yoga and attended puja (traditional worship) at a nearby temple of a well-known saint. In a short while He “knew” His life work. Soon He left for the Himalaya to live in silence and meditation for years, one-pointed on the Goal of Liberation. Many places of pilgrimage were visited during those years, walking on foot many miles each day. But a small cave at Gangotri, the temple village near the source of the Ganga River, was the place of His greatest spiritual disciplines, awakenings and, finally, Illumination. In 1958 He descended into the plains of India for His God-given mission to the world. The first Ashram founded by Swami Amar Jyoti was Jyoti Ashram, under Ananda Niketan Trust, located in Pune, Maharashtra, India. Throughout the years after leaving home, His mother had never ceased searching for Him and awaiting His return. In answer to her prayers, He settled in Pune where she could be near Him. In 1961 He accepted an offer by a devotee to visit the United States. Again, He traveled unknown, though He soon attracted many who had never seen such a Holy Man. 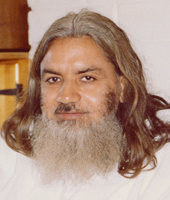 Eventually He was persuaded by the sincerity of His American disciples to establish an Ashram, and Sacred Mountain Ashram was founded in 1974 followed in 1975 by Desert Ashram under Truth Consciousness, a nonprofit organization that serves as a vehicle for Gurudeva’s work in the United States. Human evolution and upliftment of consciousness do not come about through cultural or technological advance, but more by the blessing of spiritual unfoldment. In this sacred process, the Master-disciple relationship is paramount, so much so that it is known as the highest of all relationships on earth. It is the Guru who helps awaken the sleeping consciousness within each soul to the eternal Truth, the Oneness of the Divine and all creation. The Guru brings each soul a vision for an awakened life, based upon spiritual principles, through Satsang (Sanskrit: Communion with Truth), Spiritual Retreats and personal guidance. The wisdom of the Bhagavad Gita, given by Krishna in India 5000 years ago, is explained in depth with relevance to today’s seeker. Krishna reveals why attachment affects our perception of reality.